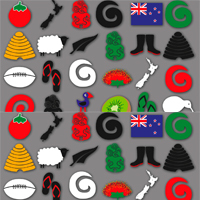 I've been popping in a little NZ something into my swaps and thought this would be a great swap to refresh/boost your collection of kiwiana that you can keep, use, or send to our international friends in other swaps. Send 6 items to your partner and they can be anything to do with NZ. Try to think on the flat side, so it doesn't increase postage if sending overseas.